Journalist and novelist Katz (The Father’s Club, 1996, etc.) 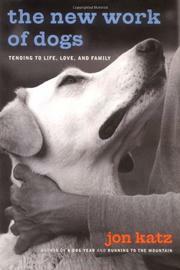 delves further into the canine territory he first explored in A Dog Year (2002). Now that dogs work less at herding and the other skills they were bred for, he wonders, what kinds of work are they being asked to do? Correlating the skyrocketing pet population with excessive TV, Internet, and DVD use, Katz believes that dogs are being solicited to tend to Americans’ emotional needs in a society whose members feel disconnected from one another. He focuses on his hometown, Montclair, New Jersey, to examine the evolving human-dog relationship. We meet Sandra Robinson, a childless, separated, middle-aged woman who gets a dachshund puppy named Eleanor Rigby for all the wrong reasons; she wants it to resolve issues from her past and to serve as an anchor in the midst of enormous personal and professional changes. Ellie tries admirably to fulfill all these emotional needs, and everything’s fine until Robinson begins to recover her footing and starts to view the puppy as “demanding and whiney.” We also meet Betty Jean Scirro, an office worker who has dedicated her life to rescuing abused and abandoned dogs, then rehabilitating them in her small house until they can be adopted. (“What does it say about a country that’s developed an extraordinarily sophisticated and comprehensive structure for saving dogs, but no equivalent one for rescuing endangered or troubled people?” Katz asks.) Other encounters involve Rob Cochran, an overworked attorney who considers his Lab his best friend; terminally ill Donna Dwight and her Welsh corgi (this story alone is worth the price of the book); and 14-year-old Jamal Sutton, who has an abusive relationship with a pit bull. Although Katz owns two border collies and is clearly wild about dogs in general, he is troubled that owners try to deny or alter the very nature of animals to suit their needs. A thoughtful and balanced look at what people require of their pets.